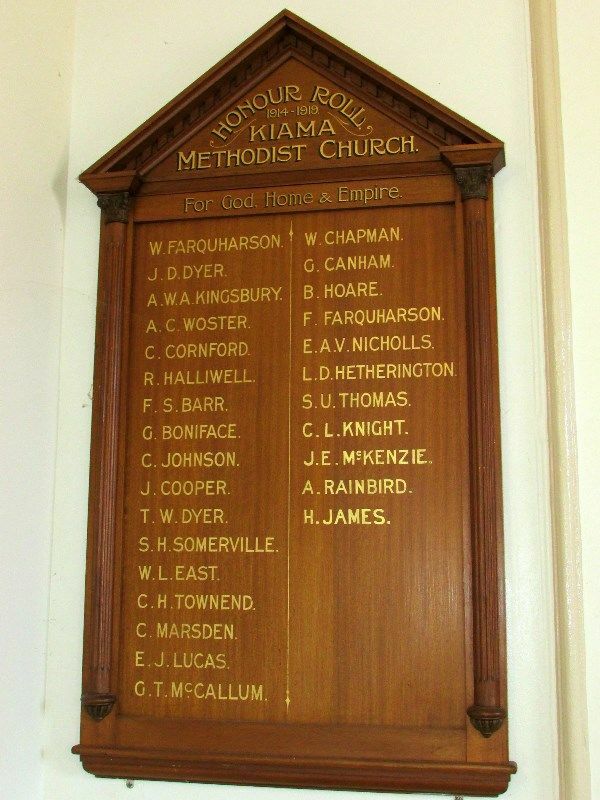 The Roll of Honour commemorates those from the church who served in World War One. UNVEILING HONOUR ROLL AND MEMORIAL TABLETS. 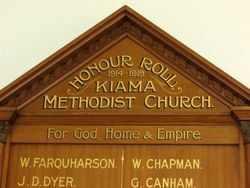 KIAMA. The above ceremony took place on Sunday evening, August 18th, by the Rev. Chaplain-Colonel Prescott, assisted by Chaplain-Captain McCallum. There was a good attendance, the church being full, and about 50 occupying seats in the large vestry at the back. District military officers, cadets, South Coast "March to Freedom" men (who reached Kiama in time for the week-end), the Mayor and aldermen, and representatives of the local Red Cross and War Chest Societies, attended, and occupied specially reserved seats. Mr. Hector Lamond, M.H.R., was also present. The church was decorated with bowls of white lilies, the communion table massed with freezias, white stock, and asparagus fern. 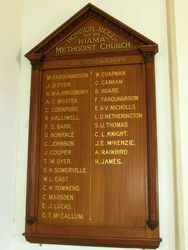 The honour roll erected to perpetuate the names of the young men of the Kiama Methodist Church who have joined the colours is of highly-polished Queensland maple. The Rev. Chaplain-Colonel then drew aside the Union Jack covering the roll, and in a few well-chosen words expressed the hope that the worshippers in this church would constantly remember in prayer these soldier lads who were fighting for God and King and Empire. The chaplain-colonel then unveiled two art metal tablets, which bear the following inscriptions respectively:— "19th Battalion, 5th Brigade, A.I.F. An Anzac. In loving memory of Sgt. W. Farquharson, killed in action at Bullecourt 3rd May, 1917. Aged 25." "35th Battalion, 9th Brigade, A.I.F. 'Until the day break and the shadows flee away." Cant. 2:17. In loving memory of Private Wentworth L. East, killed in action at Messines, France, June 7th, 1917. " These tablets were erected by 'the parents of the deceased heroes. The Methodist (Sydney), 31 August 1918. For God, Home & Empire.